I just put the final coat of Danish oil on this rocker/glider I built for my sister and brother-in-law to celebrate the newest member of the family, born last December. The Black Walnut came from a tree that was struck by lightning in my parents’ neighbor’s back yard in West Virginia. The back splats are laminated with a piece of Black Walnut sandwiched between two pieces of lightly spalted Maple. The Maple plugs and wedges for the tenons holding the arms in place serve to tie the piece together. This was my first attempt at the sculpted style developed by Sam Maloof and imitated/replicated/renovated by a host of fellow woodworkers. As far as I can tell by a good ol’ fashioned Google search, this may be the first ever gliding chair built in the sculpted style. If you know of one (or have built one yourself), please let me know. 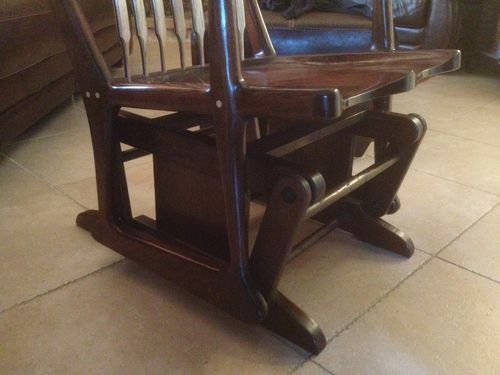 Anyone who has taken a stab at the “Maloof rocker” could appreciate the headaches I ran into when I adapted the design to a glider base. Where the typical sculpted rocking chair has a seat that narrows in the back and back legs that are canted 5 degrees to achieve an attractive splay, these options weren’t there for this design. I needed the back legs to be parallel in the back and the same distance apart as the front legs in order for the gliding mechanism to work. I tried to accomplish a bit of splay by pivoting the legs outward by 10 degrees rather than leaning them out. If I build another one, I hope to fine tune this aspect of the design. Any suggestions are welcome! 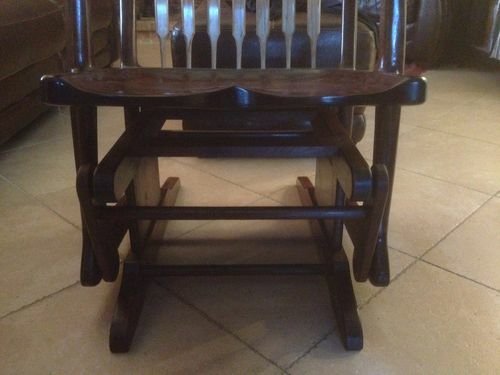 Very nice chair and you can definitely see the Maloof influence in the design. Excellent job. I have a daughter who wants a glider . . . Very well done, love the finish. What a challenge! Congratulations, it is very nice. very nice extension of a style…taking inspiration from Maloof and then adding your own touch with the glider. i love it when people pay homage to a master or a style and then extend the original, adapt it, personalize it, etc. excellent, excellent piece Harriman. love it. 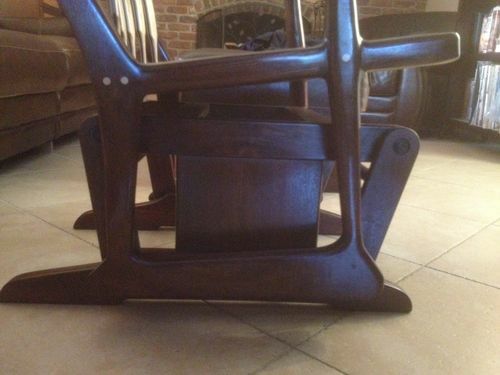 Great job on this beautiful chair. This is the first Maloof style glider I’ve seen. Leafherder (great name, by the way), I’d be happy to post some more pics, but being new to the group, I’m not sure where to put them. Should I put the images in a blog entry? Delete some of these and replace them? Any help would be appreciated. Thanks!